The Thirteenth Judicial District Commission on Judicial Performance unanimously (9-0, with one Commissioner absent) recommends that Judge Tera Neugebauer BE RETAINED. The Commission reviewed completed surveys from two attorney and four non-attorney respondents familiar with Judge Neugebauer. All of the non-attorneys recommended retention; among attorneys, 50% recommended to retain, 0% recommended not to retain, and 50% had no opinion. In addition to the survey responses and comments, the Commission also reviewed the Judge’sSelf-Evaluation, a sampling of her written rulings, and conducted courtroom observations and an interview with the Judge. As a non-attorney Judge in a small, rural community, Judge Neugebauer has faced a challenge far more daunting than that of the average new judicial officer. It is apparent that Judge Neugebauer has done much to educate herself regarding the law and legal procedure since her appointment. This was reflected in a sampling of Judge Neugebauer’s written rulings, which the Commission found to be clear, concise, thoughtful, and prepared with more skill than would be expected of a non-attorney. Judge Neugebauer has demonstrated resourcefulness in furthering her legal knowledge and initiative in seeking further experience. The Commission was impressed with Judge Neugebauer’s efforts to educate herself despite limited judicial resources and notes that her opportunities to gain experience are limited given the relatively small number of cases filed in Sedgwick County Court each year. 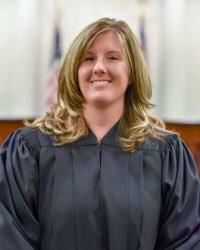 Judge Neugebauer has taken affirmative steps to further her learning, including shadowing a more experienced judicial officer, seeking and accepting input and guidance from other judicial officers, and volunteering to cover other County Court dockets when needed in order to gain more experience. Judge Neugebauer presents as kind, conscientious, and authentic. She demonstrates an ability to relate to others on a human level, although the Commission would like to see Judge Neugebauer increase the formality of her courtroom procedures and improve courtroom control. During her interview, Judge Neugebauer was very receptive to constructive feedback from the Commission and that attitude gives the impression that she takes her job seriously and desirous of continued learning and improvement.